Celebrity endorsements have always been popular, but moving toward the application side of technology is becoming the new trend. 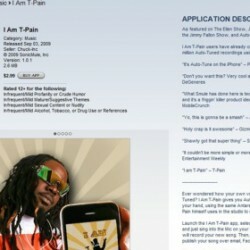 Celebrities such as T-Pain and Paris Hilton are keeping themselves relevant by offering iPhone applications for fans to download. They’re actually doing quite well. For $2.99 you can purchase T-Pain’s iPhone application, “I am T-Pain” which lets you sing a long to songs, while auto-tuning your voice. My friend has this app and it created quite a buzz during a get together. Fashonista, Donna Karan has her own free app called “Donna Karan: Donna Karan International” that lets you catch up on her latest fashion line with videos and pictures. Feeling like reconnecting with your faith again? The answer to that is the official Pope Benedict XVI: H20 app. This app is more advanced than you think… It offers several languages, so you have no excuse not to understand the diction! Paris Hilton’s $2.99 new app was revealed on David Letterman recently. (Btw, she recently turned 30!) Her app lets fans catch up with her everyday interesting life. You’re wondering why would kids have an iPhone? The iPod Touch is still selling off shelves like all the Apple products do. This past summer, I was quite shocked to see that all my little cousins were carrying an iPhone clone around at our family reunion. At Ayoka, we have the ability to develop any type of mobile device application on Androids, iPhones, and Windows 7 phones. We do not do royalty fees after the application is developed either. The mobile application is all yours!